It’s 8:30 pm and bus drivers, driver’s mates, crew, desk staff, travellers and those who have come to wave off the travellers are milling around the various buses, lined up in Fethiye otogar. Most buses to Istanbul set off at 9 pm so tickets are being checked, bags are being loaded, cigarettes are being smoked. At 8:50, the engines start and we climb onto the bus to find our seat. This is the exciting part – tomorrow morning, we’ll wake up in a new city. Hugs for those who are leaving family and friends behind and everyone begins to board. These days, the intercity buses have wireless internet and tv/radio. It’s the same every time – people find their seat, put on the headphones and start to flick through the channels. In 20 minutes time, the novelty wears off, boredom sets in and the monitors are turned off. 9 pm on the dot and the bus pulls out of the otogar. We head towards the D400, take a right towards Antalya and the tea boy makes his way along the bus to check tickets again. “Alibeyköy,” he says to us and moves on. We know the drill by now. Alibeyköy is where we’ll get off the bus in Istanbul. He makes his way back along the bus, this time with his snack trolley. Fruit juice, fizzy drinks, hot drinks – all included in the price of the journey – are on offer. We opt for the Nescafe and once again wince as we take a sip. It’s a 3-in-1 sachet; coffee, powdered milk and a ridiculous amount of sugar for such a small cup. It’s part of the journey, though. We forget about this every time. It’s dark outside. Nothing much to see as the bus climbs through the mountains. We recline our chairs and begin the process of bus-sleep. 2:20 am. We’ve had fitful sleep. Head against the window, head against the chair, leaning on each other, improvising by using my fleece jacket as a pillow (it works), shuffling and repositioning and then the bus sweeps into the service area for our first stop of the journey. Bright, fluorescent lighting stings our sleepy eyes and we take a minute to adjust before getting off to stretch our legs. We’ve got 30 minutes here. Welcome to Afyon. The 9pm Fethiye to Istanbul bus stops here every time. At 2:20 am, it’s a dream-like, surreal world of gift shops, gözleme stands producing the frothiest ayran we’ve ever seen, lokantas churning out hot meals, queues for the WC…and it’s also a world of sucuk. There’s always a sense of guilt with Afyon. We’ve lost count of the amount of times we’ve been here – but it’s always been a silly hour of the morning, en route to elsewhere in Turkey. What do we know about Afyon? Not a lot. It’s cold, icy cold in winter, and it must be famous for sucuk. Everywhere in this service area, sucuk is for sale and people queue to buy it. 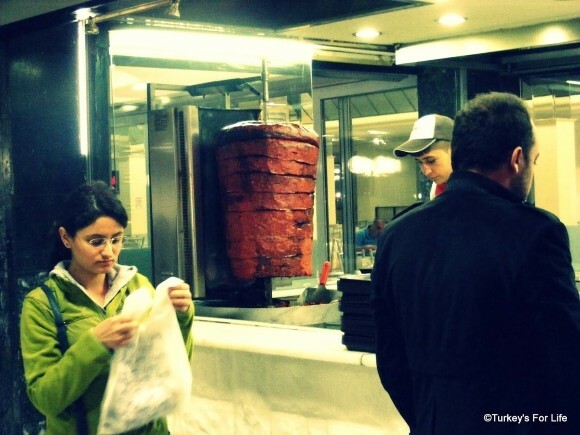 Oh how we want to try that sucuk döner. We promise ourselves we’ll try it every time we pass through Afyon – but, every time, it’s the middle of the night, we’re half asleep and we have no appetite at all. A can of Ice Tea is all we can face, right now. …it’s 6:30am and it’s a bright, sunny, new morning as we cruise towards Izmit. As more of the passengers wake up, the tea boy once more inches along the bus with his trolley. Tea, coffee and breakfast buns are handed out and, despite still feeling sleepy, it’s daylight and there’s Northwest Turkish scenery to be taken in. We’re getting close to Istanbul and within a couple of hours, the clues are all too obvious. Early-morning Istanbul rush hour traffic. A jolt to the system when we’re so used to the relative calm of Fethiye but for us, we’re not in the daily gridlock, trying to get to the office. We’re here to once again soak up all that is Istanbul. We’re happy. We’re never sure how much further we have to go until we see the bridge in the distance. Early morning on the Bosphorus Strait as we cross the Fatih Sultan Mehmet Bridge. Forget the traffic. We’re back in Istanbul! 2017 Update – Intercity buses must now use the Yavuz Sultan Selim Bridge to cross to the European side of the city. This means some bus companies have now created alternative drop off points. There are still free service buses taking passengers to various areas of Istanbul. There are various daily buses between Fethiye and Istanbul. Evening ones are express services and the journey time is reduced. Although it is possible to book seats online, a lot of the company websites don’t accept foreign cards. You can book seats on the Fetyhiye Istanbul bus by going to the otogar in Fethiye and booking at one of the bus offices. Alternatively, most companies have sub offices around Fethiye where you can book a seat. Booking is recommended. At festival times such as Ramazan Bayramı and Kurban Bayramı, book seats well in advance as many Turkish families travel the country to spend time with loved ones. Book hotels in Fethiye & Istanbul through Booking.com now. Very interesting post. I don’t think many coaches in the UK have tv on the seat backs. Can’t say I love them. But I think they are a great service cheap and normally always on time. We use them to get from Adapazari to Dikili near Izmir which is about 7 hours. The road however is through the Mountains and it can get a bit scary at times, especially last winter when it was snowing. The best trip we had was from Bodrum to Istanbul and waking up early morning to a ferry ride over the Bosphorus and having a breakfast of tea and toast watching the city approach from the water and the sunrise, you wouldn’t get that anywhere else. We always fancied doing a long distance trip on a Turkish inter-city bus but never got round to it. Pity. . . indeed we have – twice in 15 years! First time the bus (big company) broke down and the second time they loaded swordfish on top of my bag in Fethiye otogar!! Our older bones can’t take it any more so we fly; although generally I’d say the buses are excellent. Love this post….I felt like I was there on the trip with you on the bus. My experience on the bus in Turkey was one time when the planes were on strike a long time ago. We had to go from Izmir to Istanbul…well coming from North America it’s the planes we most use and the buses here are uncomfortable. Well I was upset to take the bus all night but was shocked to see a double-decker with comfy seats and a ‘teaboy’ walking around like an airplane steward handing out refreshments. Then about 2 hours before Istanbul the bus went on this huge boat that took us across some body of water…….didn’t even feel like the bus was on a boat….so smooth. ….that was my experience on the bus in Turkey…haven’t gone yet, but might take my daughter so we can see the countryside on our next visit. Thanks for sharing your post and photo’s. Gosh, I remember those buses from the time before the indoor smoking ban. Do they still hand out lemon scented water for refreshing trucker showers? OMG u r soooo lucky!! YES, I love the intercity buses…My husband and I use them often to travel here in Canada. I prefer them over the plane caus I don,t want to miss the scenery! @ Anne Mackle: Isn’t it a shame that the bus service in the UK isn’t the same. No excuse, really. I’ve used the intercity coaches a few times but, unfortunately they’re not built for people like me who are over 6 foot and weigh 18 stone. It can be worse than travelling Cattle Class on Sleasyjet. Despite that, the service they provide is still far better than UK trains or buses. About 18 months ago I toured Türkiye for two weeks with Intrepid Travel. We went to many great towns and cities on the buses: Bursa, Fethiye, Konya, Selçuk. and of course Goreme. I was impressed with the quality of the vehicles, much better than Greyhound in Canada. The stop areas are amazing too. An interesting way to sample the cuisine – so unlike the terrible fast food franchises in North America. UK Motorway Service Area Operators could learn a lot from the Turks. The service and food is always freshly prepared and tastes good. The toilets are always clean and sweet smelling. There are facilities for the washing and servicing of vehicles 24/7, attended fuel pumps, free screen washing. I’ve also used service areas operated by the Turkish Truck Drivers Association and they are run to the same standards and members of the general public are encouraged to use the facilities too. Maybe its because I can’t sleep on buses, but did you consider flying from Antalya to Istanbul? I found the domestic flights to be very cheap. I went one-way Bodrum to Istanbul to save the travel time back. How’s the price difference of the overnight bus and flying? 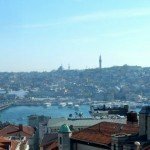 Went from Antalya to Istanbul a few years ago in November. Got very cold outside during the night – dep snow. Bus very comfortable, slept most of the way. Prefer apple tea to sweet coffee. Great Post and a great way to get around Turkey. I wish we were pulling into Istanbul in a Turkish Bus. Thanks for the valuable information on your blog. I want to know if there is an afternoon bus from fethiye to Istanbul? if yes then what would be the time duration? please let me know thanks. Thank you so much for all the guidance. I could probably take the 6 or 1 pm bus. Another friend of mine suggested that I can do the pammukale excursion from fethiye on the last day and take a bus from pammukale to Istanbul as it would be a shorter drive.